Is there a point to Recruit-A-Friend anymore? This was originally published just for our supporters on Patreon, but now it’s available for everyone. Enjoy! 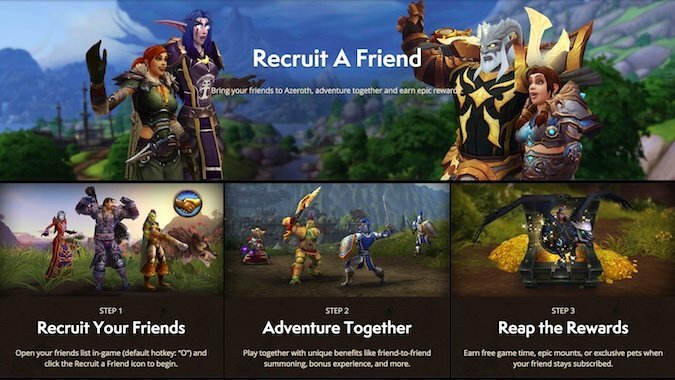 On the World of Warcraft home page, there is a very big section for Recruit-a-Friend. Created in 2008, this program was a way for you to bring a friend to Azeroth and play the game with them. Current players got a free month of game time, and both of you got triple experience when you played together. Plus, you got a Swift Zhevera mount, which was not available any other way. In 2010, the Zhevra was replaced with the X-53 Touring Rocket. This two-seater, allowed you and your friend to move about together more efficiently. In 2013, there were 4 mounts and 4 battle pets available from which to choose as a recruitment reward. The biggest change was the reduction in experience accrued while you and your friend played together. It was originally 300%. Then it was reduced to 200% and, with patch 7.3, experience was reduced to 50%. In addition, this bonus did not stack with heirloom gear. What are the current benefits? Once your friend plays and pays for three months game time, and you wait at least eight days, you can choose one from the four mounts and four pets announced back during Legion. You can summon one another every 30 minutes. There is a 50% experience boost and a 10% reputation boost for monsters killed, as long as you’re within 100 yards and four levels of each other, as well as not be above level 90. There’s also free game time and the gifting of levels to recruiter characters. Judging from the comments on the forum, getting the rewards has been problematic. I’m trying to figure out what the point of this program is now. Are there any people left to recruit? Honestly, I don’t know of anyone who actually recruited a friend via the program. People used the program to add another account, level two characters, and get a unique mount. When there was a decided experience boost while gaming, it was quite attractive. At this time, 50% isn’t that much and this bonus does not stack with rested experience. Yes — you read that right. I get if there is a player base which loves a game that is niche and new it is beneficial to have rewards for bringing in friends. However, considering how long World of Warcraft has been in existence, it’s hard to conceive of anyone who wants to play, not playing — and given how widely its talked about in mainstream publications, it’s hard to think people are just discovering it. Commercials are running for the game on network and cable television. My friends who don’t play know I play, but no amount of rewards are going to entice them into playing with me. Plus, Recruit-a-Friend been gutted so much it’s unattractive to most of the current playerbase. If Blizzard wants to keep it, relegate it to a perk on the side. “Hey, you could do this if you have a friend who is interested” instead of giving it half a page of promotion on the front of the main website. The other option is to retool it, and if they go that route, it should be returned to what it was at the beginning. Players want to level quickly. If a boost is not available, 300% experience bonus could be a major draw. I’m scratching my head here. Probably the peak of Recruit-a-Friend was Wrath of the Lich King and Cataclysm. Beyond those expansions, it feels like this program’s reach is over. Blizzard should either retire it or put it back to what it was.